Redemption of trial lenses may require an additional trip to the outlet should the lenses with the relevant power not be in stock. Customers can call in advance to check on the availability of stock. Eye examinations may need to be conducted and there might be additional fees incurred for first time wearers. This redemption is strictly limited to one per person and must be made in person with relevant photo identification documents. There will be no collection on behalf allowed. 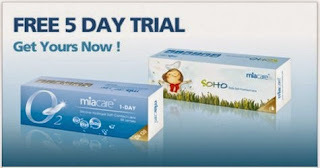 miacare and its partners may reject redemptions at their discretion. Miacare reserves the right to end this promotion without any prior notice.